I apologize for teasing you with a single post, then ignoring the blog site for three weeks. We didn’t mean to invite you all to a party and then not serve up any green beers! In my defense, I’ve been pre-occupied by the winter lecture circuit. Two good things happened today here at the Rutgers Plant Diagnostic Lab. The first is that the Professional Golf Turf Management School ended. We love the guys in the program, but after ten weeks, everybody is happy to see them go. As Dan Hicks and the Hot Licks would sing: “How can I miss you when you won’t go away? 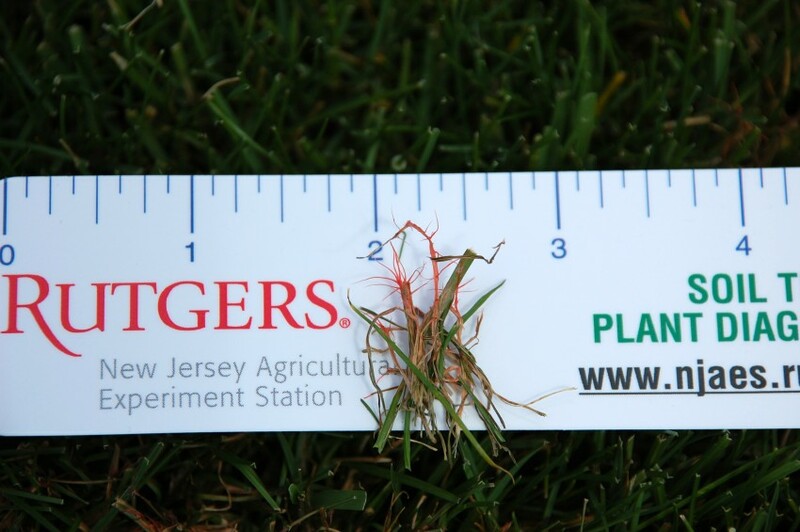 !” The end of the turf school also coincides with the end of the winter lecture circuit. All the winter programs are over, everybody has their pesticide credits up to date, and all of us have had our fill of education for the time being, so let’s go back to work. Which brings me to the second great thing about today – we got some turf samples! 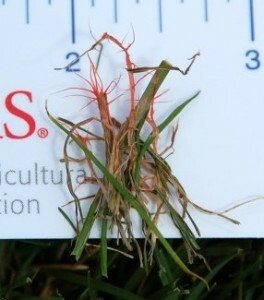 Red thread flair-up in perennial ryegrass. Red Thread is the disease of the week. We don’t get many samples of red thread in the lab, because the fungus that causes the disease, Laetisaria fuciformis, is quite distinct. Normally we would see the characteristic pseudosclerotia or “red threads” protruding from the leaf tips. In today’s sample, the red threads were not fully formed, so all we had were cottony flocks of “pinkish” mycelia and a little leaf blighting to go on. 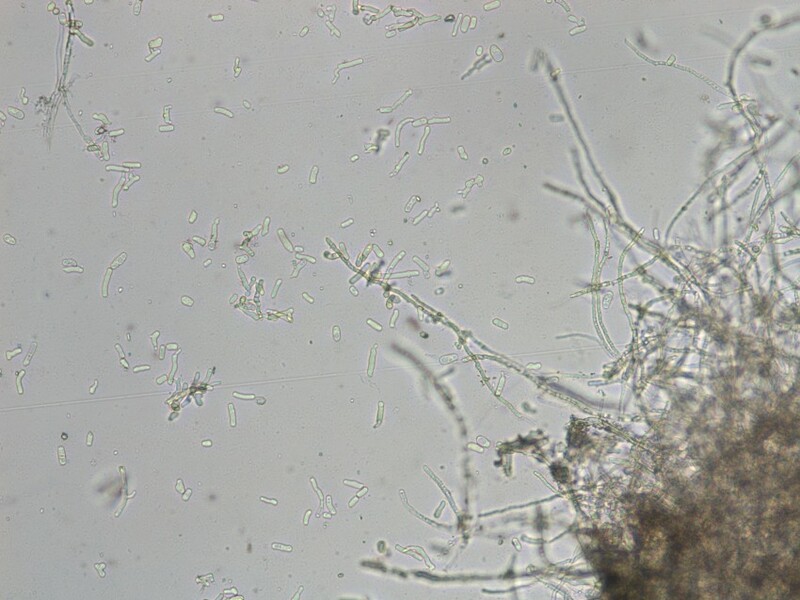 We discovered the identity of the fungus during microscopic observation of the mycelium. 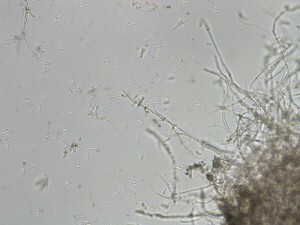 The hyphae of Laetisaria will break apart into tiny pieces called arthroconidia (asexual spores). At any rate, the pseudosclerotia allow the fungus to survive unfavorable environmental conditions and both the arthroconidia and pseudosclerotia are tools for fungal dissemination. Red thread is usually one of the first diseases active during of the year. 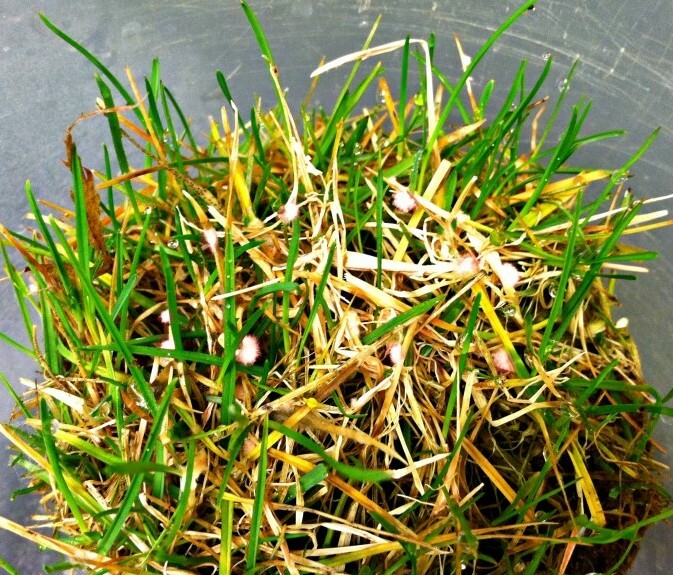 The causal fungus can grow between 32oF and 86oF, but moderate temperatures in the 60oF to- 75oF range are best. 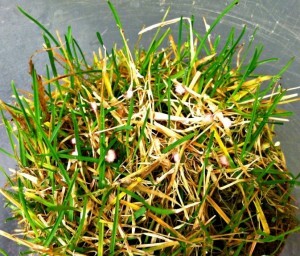 Of course, a little moisture is needed to “turn the fungus on.” Watch for increasing disease activity as we move into spring, particularly if it is raining during the optimal temperature window, and look to the “red threads” for quick field identification. Read this factsheet for information on management and control of red thread.